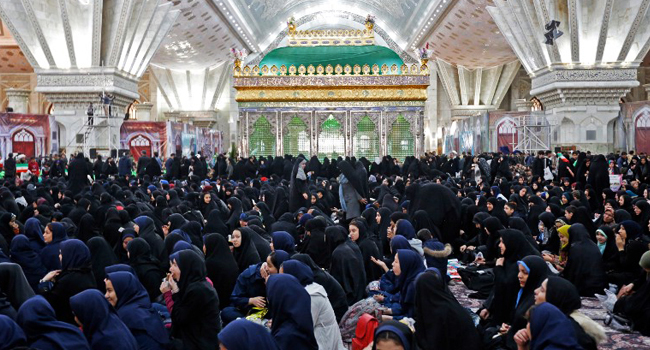 Thousands of Iranians packed the mausoleum of the Islamic republic’s founder Ayatollah Ruhollah Khomeini in Tehran on Friday to launch celebrations for the 40th anniversary of its revolution. As an army band played revolutionary anthems, the huge hall of the mausoleum was filled with people from all walks of life, among them schoolchildren dressed in the red, white and green of the Iranian flag. Ayatollah Ahmad Jannati, head of the influential experts assembly which appoints the Islamic republic’s supreme leader, delivered a keynote speech rebuking political factions seeking better ties with Washington. “America’s power is on the decline, we should not be afraid of America,” Jannati said as the crowd shouted slogans such as “Death to America” and “Death to Israel”. On February 1 each year, the “Dahe-ye Fajr” (10 days of Dawn) celebrations begin in Iran to mark the anniversary of Khomeini’s return after the pro-Western shah fled Iran following widespread demonstrations. For the 40th anniversary, decorative lights and posters have been put up in main streets in Tehran and new murals of “martyrs” painted on walls. ISNA news agency posted a video of ships blasting their horns in celebration in the Gulf port of Bandar Abbas, southern Iran. Two arms and military equipment fairs have opened in the capital, showcasing the weaponry developed and manufactured in Iran over the past four decades, especially its prized ballistic missiles. From the very start, the Islamic republic faced challenges from communist former allies as well as from separatist minorities in border regions of Iran. In September 1980, Saddam Hussein’s Iraq launched a war that dragged on for eight years. And the November 1979 seizure of the US embassy in Tehran and hostage-taking of its staff for more than 400 days triggered the still ongoing hostility between the two countries. Iran’s economy has nosedived since Washington reinstated sanctions after US President Donald Trump last May withdrew from a 2015 nuclear deal between Tehran and world powers. “Forty years have passed since the revolution and throughout these 40 years the whole world tried to destroy it… but they were unsuccessful” said Jannati. “Even now look what they are trying to do to destroy (the revolution)… this accursed America will do anything it can to defeat Islam,” he said.